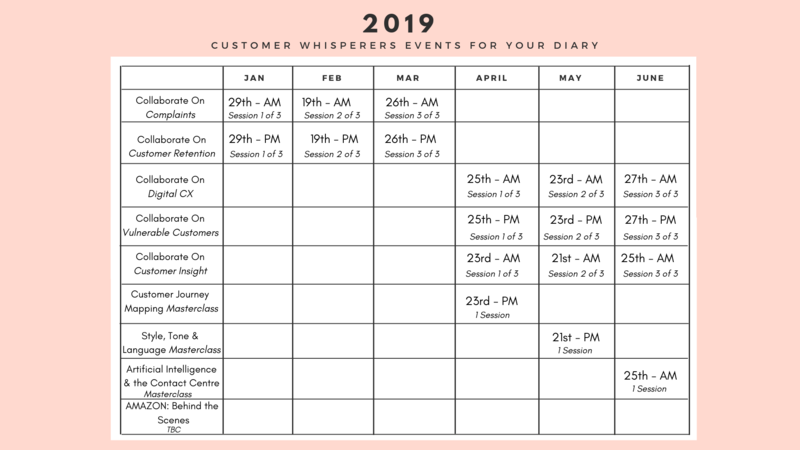 Customer Whisperers events are full of out of the box thinking which will certainly get your brain thinking. We’re not your run of the mill workshop hosts… we like to keep things new and exciting. Nobody wants to be falling asleep in front of a group of strangers! We guarantee you will learn something new. You may have noticed we hold 2 types of events… Collaborate On and Masterclasses! Let’s explain the difference between the two. Collaborate On is a series of workshops made up of different topics. Each topic is made up of 3 sessions. The theme of Collaborate On is… you guessed it… collaboration! It’s a great opportunity for delegates from cross sectors to see how everybody else is doing it! We recommend that you attend all 3 sessions as they follow on from each other when you attend a Collaborate On event. Masterclasses are one off, 3 hour events. They are an insight into services we at Customer Whisperers provide. A taster if you like! We are able to have larger groups of people at our masterclasses because these are more fun when you’re in a small group from your own company. To sign up to our mailing list to receive early bird information, click here! But as you slide down that customer satisfaction scale, at some point those levels of commercial benefit are reduced by HALF. And most people guess that happens at between 5 and 7 out of 10 – most customers are happy, right? Maybe, but its cost you dear. If you’d like to talk about how you make the step from where you are now to consistently achieving customer satisfaction at 9 out of 10 and over or you’d like to work through the commercial benefits for you, get in touch, we’d love to help. http://customerwhisperers.com/wp-content/uploads/2018/05/2.jpg 832 960 Customer Whisperers Customer Whisperers2018-05-25 10:32:152019-01-16 13:10:068 out of 10 is only just good enough!